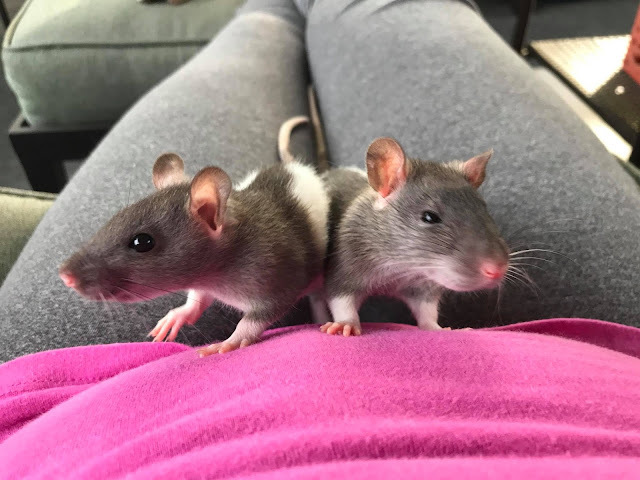 Many of you know by now that I have always owned rats and this time I got two males, Meeko and Jax. They were siblings and they've been getting along great. I've always read that having more than one is great because they have a constant companion to bond with. I also read that sometimes they can fight and need permanently separated. Well, that happened with Meeko and Jax. Everything was great until it wasn't. Males can get very dominant with each other especially when they go through puberty. Well, I noticed over the a one week period at the end of December that there's been squealing and squabbling and some actual wrestling type fights. I hoped it was just a fluke. But then this happened. Meeko has a bald spot on the back of his neck and then I saw that Jax had some bloody wounds on his side. I separated them immediately. I debated and asked friends for advice but in the end keeping them separate was the best choice for me. The alternative is to neuter them and I just didn't want to go that route. So I got this awesome GIANT cage from Chewy and the moment it came I set it up and made it like a new welcoming home for Jax. I even adorned it with these adorable Kaytee Small Animal Chews from Chewy. They will let him chew and embrace his instincts and hopefully even get some frustration out. It's always important to provide rats with stuff like that because not only do they need to embrace their chewing instincts but they also need to keep their teeth filed down. This was Jax in his holding aquarium before his cage came. I felt very sad. It's bittersweet. I know they will still see each other because their cages will be next to each other. It's just safer to separate two male rats once blood is drawn. The fights had been so bad it woke us up at night and it was hard to break them apart. The day I made the decision I actually came home from work and they were sleeping together so I was so relieved. Then I took a shower and when I came out I saw the new wound. They had fought right after I got in the shower. What does this mean going forward? Well, they will live apart, and that may seem sad but I will be giving them each daily love every day more than I did before. I have always own solo male and females in the past and they seemed happy and lived a long happy and healthy life so I'm not really worried about it. Have you ever had two pets that fought? Sorry to hear you rat were fighting. Glad you were able to figure something out. Yea thank goodness. I'm so relieved now. That's so sad, Ellen! Poor little guys, too bad they can't just get along. Wow, you really give them a nice home though!! I know but you know what they seem pretty happy separated now and they can still see each other and probably communicate from across the way lol! !